For the most part, Google’s Accelerated Mobile Pages project was about what its name implies: accelerating mobile pages. Unsurprisingly, that mostly meant quickly loading and rendering existing articles on news sites, recipes and other relatively text-heavy content. With that part of AMP being quite successful (if not always beloved) now, Google is looking to take AMP beyond these basic stories. At its AMP Conf in Amsterdam, the company today announced the launch of the AMP story format. The overall idea here isn’t all that different from the stories format you are probably already familiar with from the likes of Instagram and Snapchat. This new format allows publishers to build image-, video- and animation-heavy stories for mobile that you can easily swipe through. 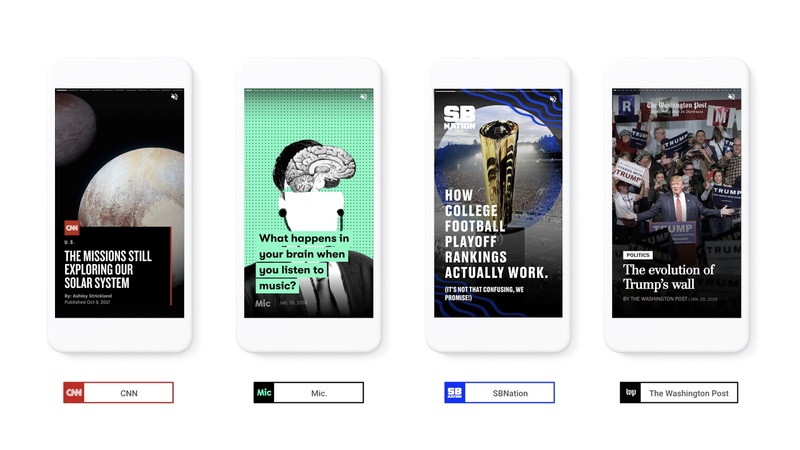 “It’s a mobile-focused format for creating visually rich stories,” as Google’s product manager for the AMP project Rudy Galfi called it when I talked to him last week. “It swings the doors open to create visually interesting stories.” To launch this format, Google partnered with CNN, Conde Nast, Hearst, Mashable, Meredith, Mic, Vox Media and The Washington Post. Like all of AMP, this is an open-source project and publishers can extend it as needed. While I’m not sure if publishers will fully embrace this format, I have to admit that the existing AMP stories I looked at made for a nice diversion. The Washington Post used the format to experiment with a timeline of North Korea’s participation in the Olympics, for example. Vox, unsurprisingly, used it for explainers, among other things, and Mashable probably went further than most by using video, sound and animations across most of its stories.